Rewind Review: Brazil (1985) | What About Movies? 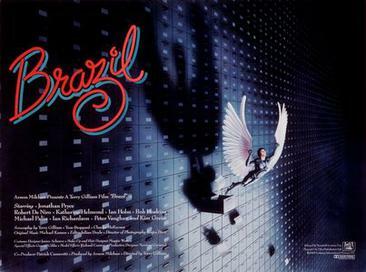 “Brazil (1985 film) poster” by BFI Film Forever. Having been previously familiar with Terry Gilliam’s work, I thought I knew what I was getting into with Brazil (1985). But it turns out, anything involving Terry Gilliam is always bound to take me out of my depth. Brazil (1985) is Gilliam’s fantastical vision of a post-apocalyptic future ruled by an inefficient but powerful bureaucratic government called the Ministry of Information. Jonathan Pryce stars as Sam Lowry, a beleaguered clerk from one of the government’s branch called The Department of Information Retrieval. His humdrum life is punctured by constant dreams of him as a flying warrior rescuing an effervescent blonde trapped inside a cage. While correcting a mistake caused by a bug (literally) in The System, something that the Ministry won’t admit to, Sam meets a suspected terrorist named Jill Layton who looks exactly like the blonde woman in his dreams. Later he gets accused of aiding and abetting terrorist attacks, and about 7 more other preposterous charges including wasting Ministry’s time and paper, therefore putting him and his lady love on the run. Perhaps the first thing that you will notice in Brazil is the strangeness of the surroundings. It is set in a 20th century world, way ahead the 1985 movie release. But then you begin to see certain outdated elements like 1940s clothes, Victorian furniture and decor, and black and white TV programs, all amidst futuristic architecture and technology. It’s one mad, elaborate and detailed retro-future. But it’s a well realized one, seamless in execution and grand in spectacle. Terry Gilliam and his cinematographer Roger Pratt also does some excellent composition for Brazil. Each frame has strong artistic sense with visual elements arranged for maximum effect. Okay, so a lot of the set pieces and costumes are of the Tim Burtonesque variety, bizarre and nightmarish, and be prepared for certain images to haunt your waking life. These are the ones mostly for the purposes of tone and atmosphere. But then there are those set pieces that are fraught with meanings. Meanings that reinforce one or more of the film’s themes. The most prevalent would be the ductwork, flexible plastic tubes that cover every inch of every home and establishment. They are inside walls, they are hanging from the ceilings, they are everywhere. They jar every frame like slithering springy worms. And no one but authorized Ministry personnel can touch them. It wasn’t explicit that these ducts were used as a means for spying, of keeping tabs on everyone but it seems to be the most obvious meaning to them. And if you keep an eye on the background you will notice propaganda posters that say things like: “Suspicion Breeds Confidence”, “Don’t Suspect A Friend, Report Him”, “Trust In Haste, Regret at Leisure”. This gives you a clue as to what kind of government the Ministry is, in Terry Gilliam’s trademark cheekiness. But Brazil is more than just pure visual spectacle with no substance. It has a compelling and layered narrative, tackling numerous themes such as: bureaucracy, terrorism, industrialization, totalitarianism, societal preoccupation with youth and looks, consumerism, love, escapism. Okay, if you feel a headache coming, I hear you. But what keeps Brazil from being overwhelmingly stuffy is Terry Gilliam’s brand of comedy. Nobody does socio-political commentary with wit and humor quite like him. Brazil is a brilliant piece of satirical work and it also does not fall short on some entertaining slapstick comedy. Seeing Sam Lowry grappling with a somewhat live desk had me in stitches. Ultimately what Brazil does is recognize the longing of an everyman like Sam Lowry to escape from the gross inefficiency and injustice of The System. But it also recognizes the stark reality that The System cannot be beat, not always. And certainly not by a single government clerk, or a handful or renegades even. Sure we have our dreams where we get to be the hero, defeat the bureaucracy and get the girl and live happily ever after. But the sad truth is that dreams don’t often come true, not in the real world. And there are times when putting faith in them can be folly. But what I find to be Gilliam’s mad genius is that Brazil’s ending will leave you with a sense of unease. Did the bad guys win? Or did our hapless hero pull one over them? Was that a happy ending or a sad one? I honestly cannot give you an answer and perhaps never will.